Bonds rallied around the world during March, driven by investors’ increasing fears for global growth, following poor economic data from the EU and a more dovish tone from the US Fed. 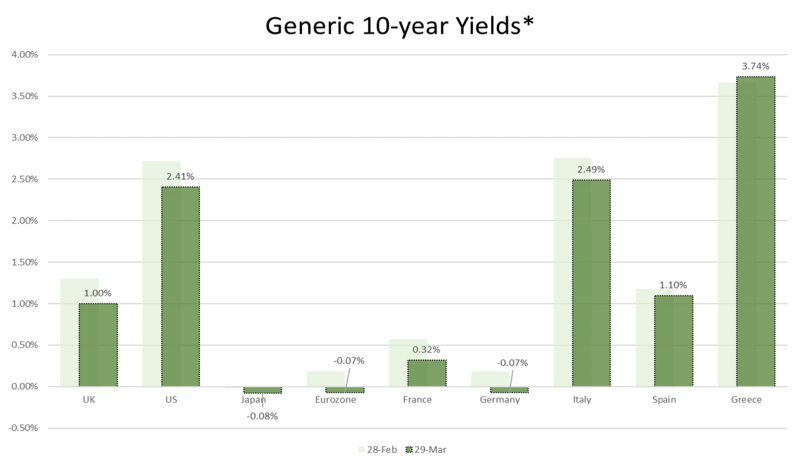 Longer-dated government bonds, and particularly index-linked issues, led the fixed income markets higher, with more sovereign bonds moving into negative yield territory. China’s stimulus efforts continued to be in focus in the 13th People’s Congress held in Beijing early in the month. Chinese authorities set a 2019 growth target of 6-6.5%, the same level that it has reported for some time, and announced additional tax cuts of 2trn RMB. The tax cuts equate to roughly 2.0% of GDP and were focussed on reducing value-added and personal income taxes. The UK approached and eventually passed the 29th March Brexit deadline, with no sign of an agreement in parliament. 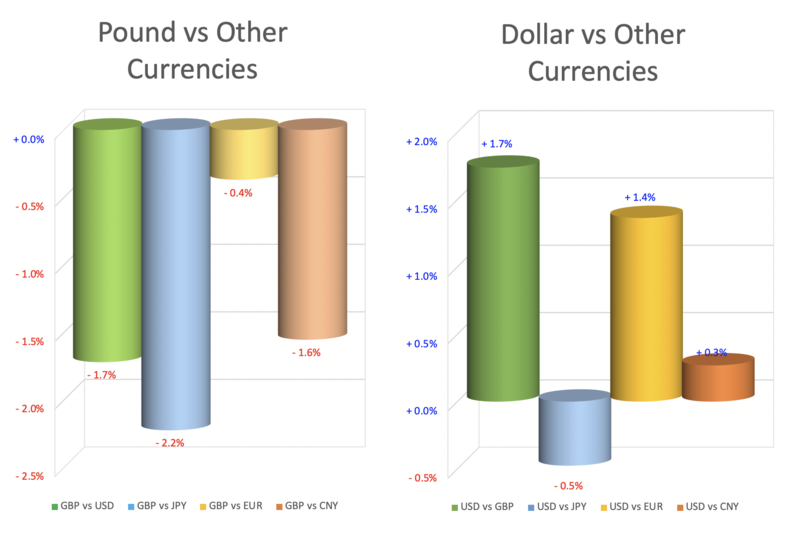 Continuing its recent volatility, Sterling gave back some of its gains from recent months, whilst the Dollar and Yen both benefited from investors’ nervousness, attracting money flows as safe havens in times of market turbulence. Market performances within the EU were diverse, as emerging markets returned mostly losses over the month, whilst the major markets shrugged off poor economic data to show mostly positive returns. The Nordics once again provided some of the best returns during the month, whilst Italy, which is already in recession, managed a gain of 3.5%. Emerging markets overall were flat during March, as measured by the MSCI Emerging Markets Index in Sterling, and underperformed their developed market counterparts as investors became nervous about the global growth outlook. Within the broad category, South America and Europe were noticeably the poorer performers, whilst the Asian economies fared much better overall led by India, which gained 11% over the month and China, which rose by 3.9%. Whilst the overall trend has been one of sideways movement and volatility, March saw most equity markets record gains. All the major markets, with the exception of Japan, gave positive returns on the month, with growth stocks being favoured over value plays. 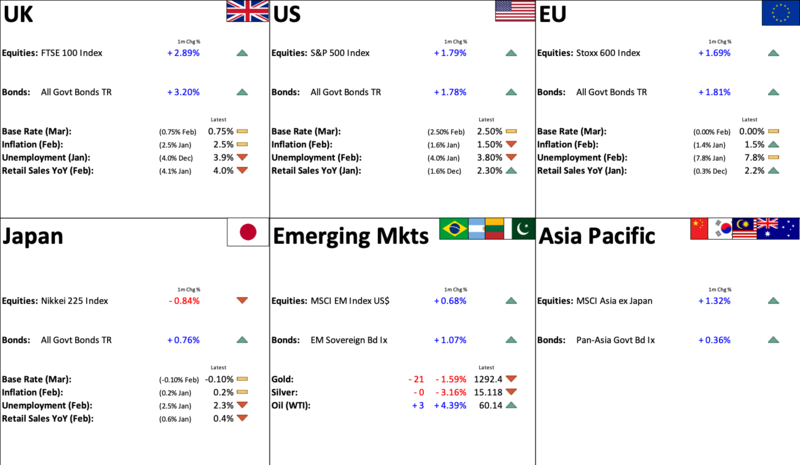 Once again it was the emerging markets that saw the most extreme movements, with Zimbabwe and India providing the low and high markers for the month. 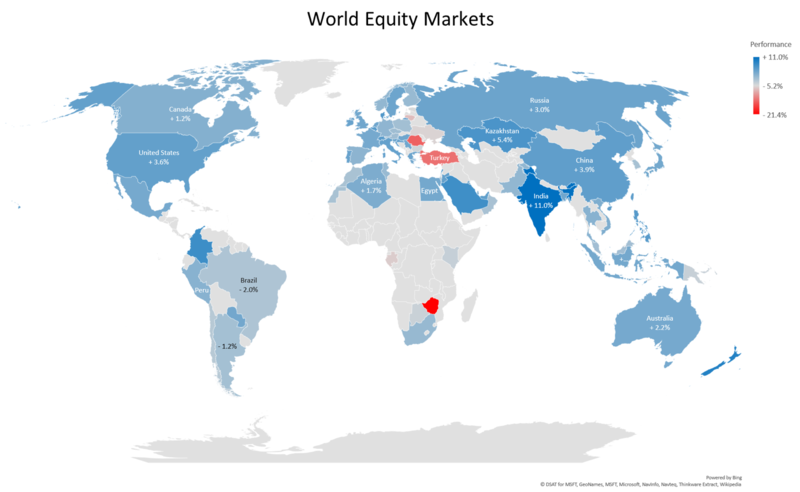 Among the emerging markets, Asia fared better than South America or Europe, with China and Russia showing respectable gains, whilst the US benefited from a rally in tech stocks, which saw the NASDAQ Index up 2.6%. 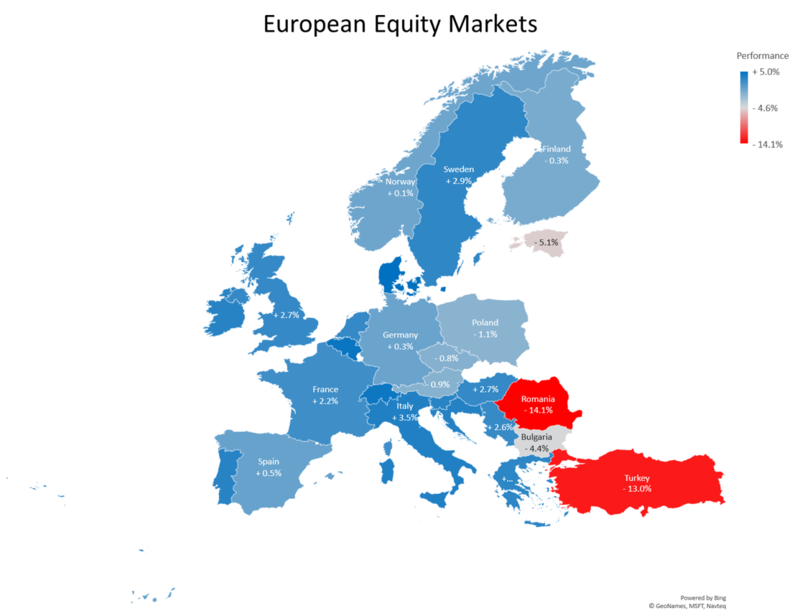 European Equities were sharply divided in March, with the emerging markets faring poorly, led by Turkey and Romania, which lost 13% and 14.1% respectively. Turkey continued to suffer from a falling currency, and restricted Lira liquidity, pushing overnight rates to 1200% at one point. The developed markets, by and large, returned gains, with Denmark rising by 5%, followed by strong showings from Italy, Sweden and the UK. Weak economic data continued to plague the EU, although this was not reflected in stock market returns, as Italy, which is in recession, was one of the best performers. The deepening of the Brexit crisis was generally ignored by equity investors, and UK shares performed well in March, compared with their EU counterparts. After a strong rise in February, Sterling retreated from its best levels in March, amid increasing frustration at the lack of progress in the UK parliament vis-à-vis a coherent Brexit plan. Economic data in the US continued to be broadly positive, but a more dovish tone from the Fed, helped to limit gains from the Dollar. The Yen rose during the month, as the temporary inversion of the US yield curve over 3m-10y, caused a resurgence of interest in the Japanese currency as a safe haven for nervous investors. As investors became increasingly nervous about the prospects for global growth, bonds performed strongly in March, with longer-dated government bonds, and particularly index-linked bonds, giving good returns sometimes in excess of 5% on the month. Bond buying drove German Bunds and other Eurozone sovereign debt to negative yields; roughly 47% of the €7.7trn Eurozone Government bond market is now offering a negative yield. Data shows that 26% of EU government bonds now yield less than the EU deposit rate of -0.4%. Analysts estimate that the number of negative-yielding bonds globally has risen to around $10 trillion from as low $7 trillion two years ago, driven by weakening economic data in the EU, China and other markets, as investors anticipate lower yields in the future. FED WATCH – when markets pore over the actions and words of the US Federal Reserve in order to determine both economic and market insight. For those of us on ‘Fed Watch’, it has been an interesting 6 months or so. Back in the summer, when the US Economic data was nearly uniformly strong, the US Federal Reserve seemed set on a course of “normalisation”, designed to get interest rates back to a more normal level rather than the historical aberration that we have seen since the Great Financial Crisis of 2008. Rates were expected to continue to rise through 2018 and into 2019 with an expected peak at around 3%. This would then give the authorities scope to start cutting rates, should the economy start to slow too rapidly. Underpinning this was the belief that, at some point, the red-hot US labour market would start to drive wages higher and that would then lead to higher inflation. On the back of this, US 10-year bond yields hit 3.23% in October. That scenario seems all very distant now. Bond yields are substantially lower at 2.40% and rather than further rate rises, interest rates are seen as being on hold for the rest of the year and the most likely next move is DOWN and not up. 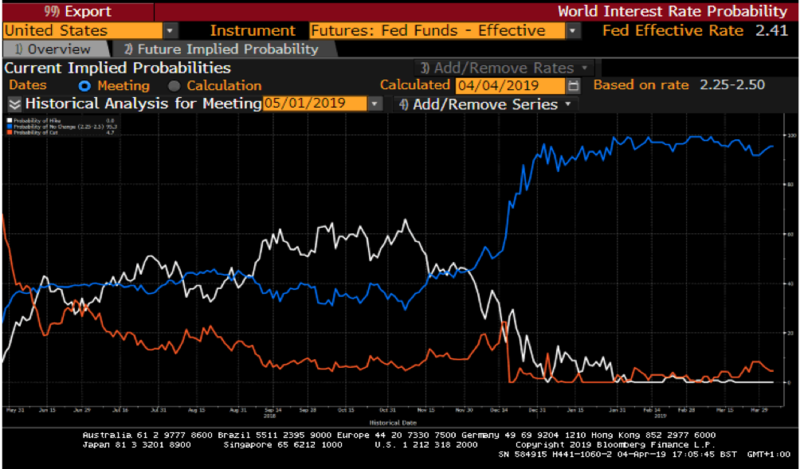 The chart below tracks market expectations for the next Fed meeting for the decision on US interest rates, with white for a rate hike, blue for no change and orange for a cut – this is an opinion poll on market expectations. Last summer a rate hike was the most popular expectation, now it is overwhelmingly for no change. So, why the change? What is the Fed up to and why does it matter so much? In some respects, very little has changed. The US economy has continued to grow strongly, though not quite at the pace we saw last summer. Some of the data is a little weaker (Industrial Production), some is stronger (Job vacancies, wages growth) and some is downright puzzling (the recent weakness in Retail Sales). Inflation also remains incredibly benign despite even stronger labour market data. But beyond the US, the economic tide is receding. The Sino-US trade dispute is impacting Chinese and Asian activity and the export led German economy has hit the buffers. The rest of the Eurozone is also struggling, resulting in an about-face from the European Central Bank, who have gone from a process of modest monetary tightening to repeating the mantra of doing whatever it takes to keep the party going. Markets, particularly bond markets, are prone to periods of pessimism and it is not too far from the truth to suggest that equity managers are glass half full characters whereas bond managers see the glass being half empty and suspect that the glass also has a crack in it. Both bond and equity markets had a bout of nerves back in October, and then again in December, as both (with the bond market taking the lead) felt that the Federal Reserve was being too aggressive both in its policy of fiscal tightening and the rhetoric that underpinned it. Matters were not helped by the regular lobbing of unhelpful critical tweets by the President. Whilst mild by historical standards (google ‘Johnson and the fed’), it was certainly a break from recent precedent. As is often the case in these periods of heightened market anxiety, previous obscure or volatile economic data points became the prism by which markets could clearly see the truth. The Fed was perceived to be on the wrong path and markets sent a clear message. Soothing noises then emerged from the Fed, who announced that they were to become ‘data dependant’ ie further rate rises would reflect the economic data rather than an economic theory. More wobbles in December then produced further soothing noises and a reduction in the future interest rate path, as predicted by the Fed. As time has passed those noises have become even more dovish and we now seem to have moved from the markets saying, “the Fed doesn’t see what we see” to “what does the Fed see that we cannot see”. Clearly both sentiments cannot be right, but these two sides of the same coin reflect the market anxiety. We are in both familiar (QE for ever, the return of the ‘Fed Put’) and uncharted (full employment and no inflation, high levels of absolute private and public sector indebtedness) territory, both in the US and globally. The Fed would like to normalise interest rates, but is concerned that too aggressive a policy would meet market resistance and that resistance would then lead to prolonged falls in asset prices, triggering the economic slowdown that would otherwise not occur. The danger here is that you then grant power to the markets to discourage any Fed policy that markets don’t like. Meanwhile we have seen part of the Yield Curve, the 3 month and 10-year bit, invert, so short term interest rates are higher than long term ones. This has produced a huge amount of comment about how yield curve inversions have always predicted a recession. This is true in the sense that at some point a recession does come along post a yield curve inversion, but you can wait an awfully long time. There are numerous examples of this, but to quote just one; this part of the yield curve inverted briefly in 1998. It was a further 10 years before the predicted recession finally arrived. The yield curve inversion tells us more about sentiment in the bond market, which would currently suggest that the crack in that glass has grown wider. What this creates is uncertainty and volatility, particularly in equity markets, with no clear direction either way; what we might call ‘sideways volatility’. This is why what the Fed does and says, (and how markets react to it) is so influential at the moment. As a result, markets seem more concerned about what Mr Rumsfeld described, rather than what President Roosevelt observed.